The Sharp and Flat Chords are the chords that are positioned in between the 2-steps you move up or down the fretboard in deriving chords. To illustrate clearer, let's take A-to-B derivation. Let me remind that B is 2 steps up from A. See Part-5 if you're getting lost. If you move A 1-step up, you'll have A#. Technically, A# is the same as Bb. Now study the diagram below. and, moving 1-step up, we'll get B# (or B-sharp); or C-chord as you'll find out after you read some more below. Note that there's no B# or E#, because these are C and F respectively. Likewise, there's no Cb and Fb. 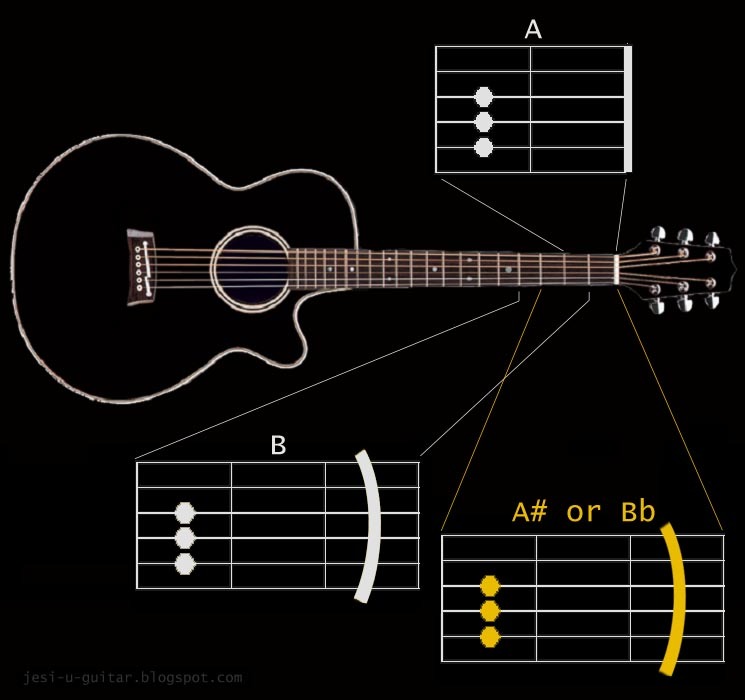 And if you have noticed, you can derive 12 chords by now!